Sometimes you just need to pay attention to signs from the cocktail gods telling you to try something new. A couple of weeks ago, I was intrigued by the Fog Cutter on the menu at Smuggler’s Cove. One of the ingredients is brandy, so immediately I mused on the possibility of using Pisco. And since yesterday was National Rum Day, I didn’t need any more reasons to use some of the Brugal Añejo I’ve been saving for special occasions. Like Pisco, rum has a rich history and was likely first distilled at sugarcane plantations in the Caribbean in the 1600’s. 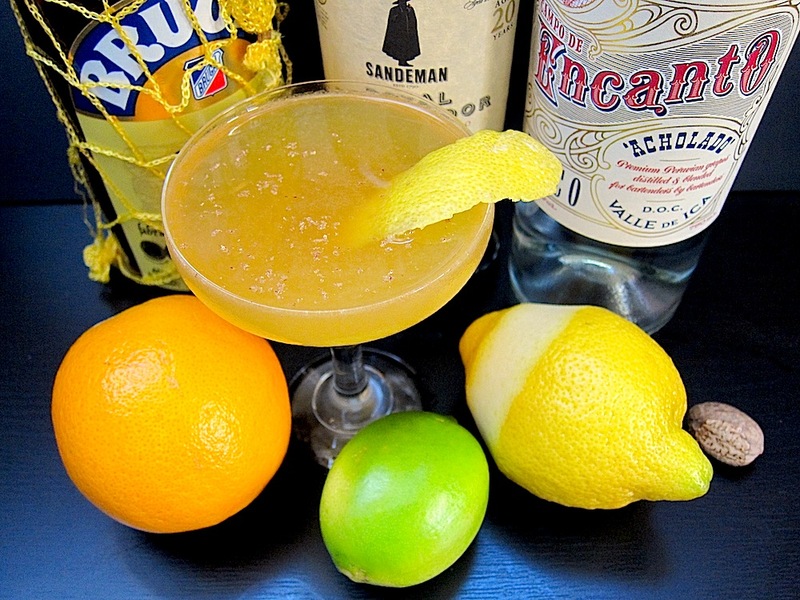 And though some Pisco cocktails such as the Peru Libre replace the rum with Pisco, this recipes mixes both spirits. Every account I’ve read about the Fog Cutter mentions that it’s a particularly strong cocktail, and this Pisco Fog Cutter is no exception — so please be extra mindful when drinking it. Starting with a traditional recipe from Trader Vic’s, I came up with a version that uses dark rum, Pisco, sherry, and thyme simple syrup. Also, it’s served strained instead of on the rocks. Some nutmeg zest on top and a lemon peel garnish completed this Tiki triptych which combines the oldest distilled spirit in the Americas with a rum that was born in 1884 and sherry that originated in 1894 — now that is history in a glass. Mix the Pisco, rum, orange juice, lime juice, and thyme simple syrup in a shaker. Add ice and shake for 30 seconds to chill. Serve strained in a coupe, float 1/2 teaspoon of sherry on top, and garnish with nutmeg zest and a lemon peel. There are many variations of the Fog Cutter, most of which call for a light rum, brandy, gin, and cream sherry. I omitted the gin, and since I am partial to Dominican rum, I used one of my favorite dark rums, Brugal Añejo. For the sherry, I used Sandeman’s Royal Corregidor, a sweet Oloroso sherry, not a dry sherry. For the Pisco, I used an Acholado which being a blend, gave the cocktail a nice balance. Also, since I enjoy fresh fruit, I used 1/2 a Valencia orange to squeeze about 1 1/2 oz fresh orange juice and 1/2 a lime to squeeze about 1/2 oz fresh lime juice. Finally, instead of orgeat, I used some thyme simple syrup that had nice floral tones.